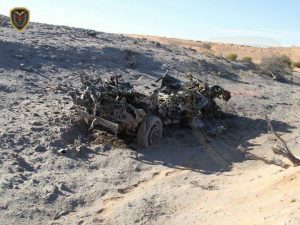 Misratan forces combing the area south-west of Sirte attacked last week by US stealth bombers say they have found 90 bodies in two separate locations. They also reported the captured two terrorist suspects and the shooting dead four more who refused to surrender. Pictures show cratered ground with burnt-out vehicles, underground stores and camouflaged hides made out of desert brush and grasses. The Misratans showed off suicide vests and ammunition that they said they had discovered. The US air strikes appear to have focused on two distinct locations some 45 kilometre south-west of Sirte. In the first, the Misratans discovered some 70 bodies. 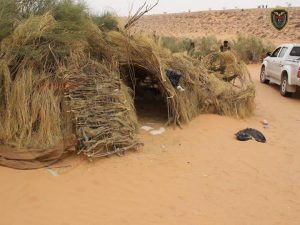 After the Bunyan Marsous operation overwhelmed IS forces in Sirte in December, it was reported that the terrorists had regrouped in the countryside and had set up training camps. BM forces reported they had been scouring a large area without making any contact with the enemy. Yet it is clear that the US B-2 bombers must have been working on detailed intelligence when they launched around 100 precision-guided missiles against the IS camps. Almost immediately afterwards, the Americans were estimating that 80 terrorists had been killed.